Asteroids is a space-themed multidirectional shooter arcade game designed by Lyle Rains, Ed Logg, and Dominic Walsh and released in November 1979 by Atari, Inc. The player controls a single spaceship in an asteroid field which is periodically traversed by flying saucers. The object of the game is to shoot and destroy the asteroids and saucers, while not colliding with either, or being hit by the saucers' counter-fire. The game becomes harder as the number of asteroids increases. 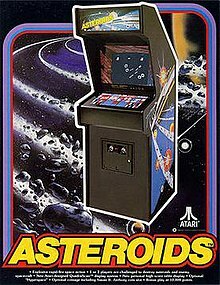 Asteroids was one of the first major hits of the golden age of arcade games; the game sold over 70,000 arcade cabinets and proved both popular with players and influential with developers. In the 1980s it was ported to Atari's home systems, and the Atari VCS version sold over three million copies. The game was widely imitated, and it directly influenced Defender, Gravitar, and many other video games. Asteroids was conceived during a meeting between Logg and Rains, who decided to use hardware developed by Howard Delman, previously used for Lunar Lander. Based on an unfinished game titled Cosmos, and inspired by Spacewar!, Computer Space, and Space Invaders, the physics model, control scheme, and gameplay elements for Asteroids were derived from these earlier games and refined through trial and error. The game is rendered on a vector display in a two-dimensional view that wraps around both screen axes. A ship is surrounded by asteroids and a saucer. Each level starts with a few large asteroids drifting in various directions on the screen. Objects wrap around screen edges – for instance, an asteroid that drifts off the top edge of the screen reappears at the bottom and continues moving in the same direction. As the player shoots asteroids, they break into smaller asteroids that move faster and are more difficult to hit. Smaller asteroids are also worth more points. Two flying saucers appear periodically on the screen; the "big saucer" shoots randomly and poorly, while the "small saucer" fires frequently at the ship. After reaching a score of 40,000, only the small saucer appears. As the player's score increases, the angle range of the shots from the small saucer diminishes until the saucer fires extremely accurately. Once the screen has been cleared of all asteroids and flying saucers, a new set of large asteroids appears, thus starting the next level. The game gets harder as the number of asteroids increases until after the score reaches a range between 40,000 and 60,000. The player starts with 3-5 lives upon game start and gains an extra life per 10,000 points. When the player loses all their lives, the game ends. Machine "turns over" at 99,990 points, which is the maximum high score that can be achieved. Asteroids contains several bugs. The game slows down as the player gains 50-100 lives, due to a programming error in that there is no limit for the permitted number of lives. The player can "lose" the game after more than 250 lives are collected. The saucer in the original game design was supposed to take a shot as soon as it appeared. This action was altered so there would be a delay before the saucer shoots. Additionally, the saucers can only aim at the player's ship on-screen, but are not capable of aiming across a screen boundary. In response to both of these behaviors, some players adopted a strategy referred to as "lurking", in which the player keeps the ship on the opposite side of the screen from the saucer when it appears, easily moving across the boundary if necessary. By keeping just one or two rocks in play, the player can shoot across the boundary and quickly destroy saucers to accumulate points indefinitely on a single credit, with little risk of being destroyed. Arcade operators began to complain about losing revenue due to this exploit. In response, Atari issued a patched EPROM to attempt to correct the issue, and due to the impact of this exploit, Atari and other companies changed their development and testing policies to try to prevent future games from having such exploits. Asteroids was conceived by Lyle Rains and programmed by Ed Logg with collaborations from other Atari staff. Logg was impressed with the Atari Video Computer System (later called the Atari 2600), and joined Atari's coin-op division and worked on Dirt Bike, which was never released due to an unsuccessful field test. Paul Mancuso joined the development team as Asteroids' technician and engineer Howard Delman contributed to the hardware. During a meeting in April 1979, Rains discussed Planet Grab, a multiplayer arcade game later renamed to Cosmos. Logg did not know the name of the game, thinking Computer Space as "the inspiration for the two-dimensional approach". Rains conceived of Asteroids as a mixture of Computer Space and Space Invaders, combining the two-dimensional approach of Computer Space with Space Invaders' addictive gameplay of "completion" and "eliminate all threats". The unfinished game featured a giant, indestructible asteroid, so Rains asked Logg: "Well, why don’t we have a game where you shoot the rocks and blow them up?" In response, Logg described a similar concept where the player selectively shoots at rocks that break into smaller pieces. Both agreed on the concept. Asteroids was implemented on hardware developed by Delman and is a vector game, in which the graphics are composed of lines drawn on a vector monitor. Rains initially wanted the game done in raster graphics, but Logg, experienced in vector graphics, suggested an XY monitor because the high image quality would permit precise aiming. The hardware is chiefly a MOS 6502 executing the game program, and QuadraScan, a high-resolution vector graphics processor developed by Atari and referred to as an "XY display system" and the "Digital Vector Generator (DVG)". The original design concepts for QuadraScan came out of Cyan Engineering, Atari's off-campus research lab in Grass Valley, California, in 1978. Cyan gave it to Delman, who finished the design and first used it for Lunar Lander. Logg received Delman's modified board with five buttons, 13 sound effects, and additional RAM, and used it to develop Asteroids. The size of the board was 4 by 4 inches, and it was "linked up" to a monitor. Logg modeled the player's ship, the five-button control scheme, and the game physics after Spacewar!, which he had played as a student at the University of California, Berkeley, but made several changes to improve playability. The ship was programmed into the hardware and rendered by the monitor, and was configured to move with thrust and inertia. The hyperspace button was not placed near Logg's right thumb, which he was dissatisfied with, as he had a problem "tak[ing] his hand off the thrust button". Drawings of asteroids in various shapes were incorporated into the game. Logg copied the idea of a high score table with initials from Exidy's Star Fire. The two saucers were formulated to be different from each other. A steadily decreasing timer that shortens intervals between saucer attacks was employed to keep the player from not shooting asteroids and saucers. The minimalist soundtrack features a "heartbeat" sound effect, which quickens as the game progresses. The game did not have a sound chip, so Delman created a hardware circuit for 13 sound effects by hand which was wired onto the board. A prototype of Asteroids was well received by several Atari staff and engineers, who would "wander between labs, passing comment and stopping to play as they went". Logg was often asked when he would be leaving by employees eager to play the prototype, so he created a second prototype specifically for staff to play. Atari went to Sacramento, California for testing, setting up prototypes of the game in local arcades to measure its potential success. The company also observed veteran players and younger players during focus group sessions at Atari itself. A group of old players familiar with Spacewar! struggled to maintain grip on the thrust button and requested a joystick, whereas younger players accustomed to Space Invaders noted they get no break in the game. Logg and other Atari engineers observed proceedings and documented comments in four pages. Asteroids was released for the Atari 2600 and Atari 8-bit family in 1981 and Atari 7800 in 1986. Released in 1981, the 2600 port was the first game to use bank switching, a technique developed by Carl Nielsen's group of engineers that increased available ROM space from 4 KB to 8 KB. Brad Stewart, the programmer tasked to work on the port, used bank switching to complete the game. A port for the Atari 5200, identical to the Atari 8-bit computer version, was in development in 1982, but was not published. The Atari 7800 version was a launch title and features cooperative play. The asteroids receive colorful textures, and the "heartbeat" sound effect remains intact. A technical demo of Asteroids was developed by iThink for the Atari Jaguar but it was never released, though a prototype exists in the hands of video game collector Richard Turner, owner of the JustClaws website who demonstrated it during E-JagFest 2000. It's also referred to unofficially as Asteroids 2000. In 2017, a ROM image of the prototype was released online. Asteroids was immediately successful upon release. It displaced Space Invaders by popularity in the United States and became Atari's best selling arcade game of all time, with over 70,000 units sold. Atari earned an estimated $150 million in sales from the game, and arcade operators earned a further $500 million from coin drops. Atari had been in the process of manufacturing another vector game, Lunar Lander, but demand for Asteroids was so high "that several hundred Asteroids games were shipped in Lunar Lander cabinets". Asteroids was so popular that some video arcade operators had to install large boxes to hold the number of coins spent by players. Asteroids received positive reviews from video game critics and has been regarded as Logg's magnum opus. William Cassidy, writing for GameSpy's "Classic Gaming", noticed its innovations, including being one of the first video games to track initials and allow players to enter their initials for appearing in the top 10 high scores, and commented, "the vector graphics fit the futuristic outer space theme very well." In 1996, Next Generation listed it as number 39 on their "Top 100 Games of All Time", particularly lauding the control dynamics which require "the constant juggling of speed, positioning, and direction." Asteroids was ranked fourth on Retro Gamer's list of "Top 25 Arcade Games"; the Retro Gamer staff cited its simplicity and the lack of a proper ending as allowances of revisiting the game. In 2012, Asteroids was listed on Time's All-TIME 100 greatest video games list. Entertainment Weekly named Asteroids one of the top ten games for the Atari 2600 in 2013. It was added to the Museum of Modern Art's collection of video games. By contrast, in March 1983 the Atari 8-bit port won sixth place in Softline's Dog of the Year awards "for badness in computer games", Atari division, based on reader submissions. Richard A. Edwards reviewed the 1981 Asteroids home cartridge in The Space Gamer No. 46. Edwards commented that "This home cartridge is a virtual duplicate of the ever-popular Atari arcade game. [...] If blasting asteroids is the thing you want to do then this is the game, but at this price I can't wholeheartedly recommend it." Usage of the names of Saturday Night Live characters "Mr. Bill" and "Sluggo" to refer to the saucers in an Esquire article about the game led to Logg receiving a cease and desist letter from a lawyer with the "Mr. Bill Trademark." Released in 1981, Asteroids Deluxe is the first sequel to Asteroids. Dave Shepperd edited the code and made enhancements to the game without Logg's involvement. The onscreen objects were tinted blue, and hyperspace was replaced by a shield that depleted if used. The asteroids rotate, and the added killer satellite enemy breaks apart into smaller ships when hit that home in on the player's position. The arcade machine's monitor displays vector graphics overlaying a holographic backdrop. The game is much more difficult than the original and enables saucers to shoot across the screen boundary, eliminating a common strategy for high scores in the original game. It was followed by Owen Rubin's Space Duel in 1982, featuring colorful geometric shapes and co-op multiplayer gameplay. In 1987's Blasteroids, Ed Rotberg added "power-ups, ship morphing, branching levels, bosses, and the ability to dock your ships in multiplayer for added firepower". Blasteroids uses raster graphics instead of vectors. The game was included as part of the Atari Lynx title Super Asteroids & Missile Command, and featured in the original Microsoft Arcade compilation in 1993, the latter with four other Atari video games: Missile Command, Tempest, Centipede, and Battlezone. Activision made an enhanced version of Asteroids for PlayStation, Nintendo 64, Microsoft Windows, and the Game Boy Color in 1998. Doug Perry, writing for entertainment and video game journalism website IGN, praised the high-end graphics – with realistic space object models, backgrounds, and special effects – for making Asteroids "a pleasure to look at" while being a homage to the original arcade version. The Atari Flashback series of dedicated video game consoles have included both the 2600 and the arcade versions of Asteroids. Published by Crave Entertainment on December 14, 1999, Asteroids Hyper 64 is the Nintendo 64 port of Asteroids. The game's graphics were upgraded to 3D, with both the ship and asteroids receiving polygon models along static backgrounds, and it was supplemented with weapons and a multiplayer mode. IGN writer Matt Casamassina was pleased that the gameplay was faithful to the original but felt the minor additions and constant "repetition" was not enough to make the port "warrant a $50 purchase". He was disappointed about the lack of music and found the sound effects to be of poor quality. In 2001, Infogrames released Atari Anniversary Edition for the Sega Dreamcast, PlayStation, and PC compatibles. Developed by Digital Eclipse, it included emulated versions of Asteroids and other old Atari games. Jeff Gerstmann of GameSpot criticized the Dreamcast version for its limitations, such as the presentation of vector graphics on a low resolution television set, which obscures the copyright text in Asteroids. The arcade and Atari 2600 versions of Asteroids, along with Asteroids Deluxe, were included in Atari Anthology for both Xbox and PlayStation 2. Released on November 28, 2007, the Xbox Live Arcade port of Asteroids has revamped HD graphics along with an added intense "throttle monkey" mode. Both Asteroids in its arcade and 2600 versions and Asteroids Deluxe were ported to Microsoft's Game Room download service in 2010. Glu Mobile released a mobile phone port of the game with supplementary features as well as the original arcade version. Asteroids was included on Atari Greatest Hits Volume 1 for the Nintendo DS. Craig Harris, writing for IGN, noted that the Nintendo DS's small screen can not properly display details of games with vector graphics. Asteroids inspired many direct clones." By December 1981 BYTE observed that "If imitation is the sincerest form of flattery, then [Atari's Asteroids has] a lot to be proud of ... Its popularity has inspired numerous imitations", including eight for personal computers. Quality Software's Asteroids in Space (1980) was one of the best selling games for the Apple II and was voted one of the most popular software titles of 1978-80 by Softalk magazine. Three other Apple II Asteroids-clones were reviewed together in the 1982 Creative Computing Software Buyers Guide: The Asteroid Field, Asteron, and Apple-Oids. In the last of these, the asteroids are in the shape of apples. Others clones include Acornsoft's Meteors, Moons of Jupiter for the VIC-20, and MineStorm for the Vectrex. The Mattel Intellivision title Meteor! , an Asteroids clone, was cancelled to avoid a lawsuit, and was reworked as Astrosmash. The resultant game borrows elements from Asteroids and Space Invaders. On February 6, 1982, Leo Daniels of Carolina Beach, North Carolina, set a world record score of 40,101,910 points. On November 13 of the same year, 15-year-old Scott Safran of Cherry Hill, New Jersey, set a new record at 41,336,440 points. In 1998, to congratulate Safran on his accomplishment, the Twin Galaxies Intergalactic Scoreboard searched for him for four years until 2002, when it was discovered that he had died in an accident in 1989. In a ceremony in Philadelphia on April 27, 2002, Walter Day of Twin Galaxies presented an award to the surviving members of Safran's family, commemorating his achievement. On April 5, 2010, John McAllister broke Safran's record with a high score of 41,838,740 in a 58-hour Internet livestream. ^ "Production Numbers" (PDF). Atari. 1999. Archived (PDF) from the original on January 27, 2013. Retrieved March 19, 2012. ^ a b Monfort, Nick & Bogost, Ian (2009). Racing the Beam. MIT Press. ISBN 978-1-234-56789-7. ^ a b "The Making of Defender". Retro Gamer. No. 55. Imagine Publishing. October 2008. pp. 34–39. ^ a b c d Chris Kohler (November 17, 2011). "Asteroids Designer Ed Logg Honored With Pioneer Award". Wired. Condé Nast Publications. Archived from the original on December 8, 2013. Retrieved December 28, 2013. ^ a b c d e f g h i j k l m n o p q "The Making of Asteroids" (PDF). Retro Gamer. No. 68. Imagine Publishing. 2009. Archived from the original (PDF) on December 19, 2013. Retrieved December 18, 2013. ^ a b Salen, Katie & Zimmerman, Eric (2004). Rules of Play: Game Design Fundamentals. MIT Press. ISBN 0-262-24045-9. ^ a b c d e f g "Edge Staff". "The Making of Asteroids". Edge. No. 117. Future plc. Archived from the original on January 4, 2014. Retrieved January 4, 2014. ^ Bjork, Staffan & Holopainen, Jussi (2005). Patterns in Game Design. Charles River Media. p. 60. ISBN 1-58450-354-8. ^ a b David Owen. "Invasion of the Asteroids". Esquire. Vol. 2 no. 81. Hearst Corporation. Archived from the original on June 22, 2008. ^ Michael Blanchet (March 19, 1982). "Beating the Video Games: Lurking on an Asteroid". The Miami News. Retrieved January 4, 2014. ^ a b c Brett Alan Weiss. "Asteroids". allgame. Macrovision. Archived from the original on March 8, 2009. Retrieved June 6, 2009. ^ a b c d William Cassidy. "Asteroids". ClassicGaming. IGN. Archived from the original on October 29, 2012. Retrieved January 6, 2014. ^ Dillion, Roberto (2011). "Part 1: Games That Pushed Boundaries". The Golden Age of Video Games: The Birth of a Multibillion Dollar Industry. CRC Press. p. 58. ISBN 978-1-4398-7323-6. ^ Asteroids Flyer, 1979, Atari, Inc.
^ a b Vendel, Curt & Goldberg, Marty (November 2012) [1st. Pub. 2012]. "Chapter 8". Atari Inc.: Business Is Fun. Syzygy Company Press. p. 515. ^ Reichert, Matt. "Asteroids". AtariProtos.com. Retrieved September 19, 2014. ^ Brett Alan Weiss. "Asteroids (Atari 7800)". allgame. Macrovision. Archived from the original on November 14, 2014. Retrieved January 7, 2014. ^ Turner, Richard. "Asteroids by iThink". justclaws.atari.org. Archived from the original on September 15, 2007. Retrieved August 4, 2018. ^ Hieronymus, Lars (November 12, 2000). "Photos of the first €-JagFest". e-jagfest.de. Archived from the original on September 23, 2005. Retrieved August 4, 2018. ^ Baranski, Björn (March 25, 2015). "European Atari Jaguar Festival 2000". ejagfest.de. Archived from the original on June 18, 2018. Retrieved August 4, 2018. ^ Jeffrey_Bones (November 26, 2017). "Asteroids 2000 by ithink". AtariAge. Retrieved April 8, 2018. ^ Wolf, Mark J.P. (2008). The video game explosion: A history from Pong to Playstation and beyond. Greenwood Press. ISBN 0-313-33868-X. ^ Demaria, Russel; Wilson, Johnny I. (2004). High Score! The Illustrated History of Electronic Games (2nd ed.). McGraw-Hill/Osborne. ^ a b Retro Gamer Staff (September 2008). "Top 25 Arcade Games" (PDF). Retro Gamer. No. 54. Imagine Publishing. p. 68. Archived (PDF) from the original on February 1, 2014. Retrieved January 22, 2014. ^ "Top 100 Games of All Time". Next Generation. No. 21. Imagine Media. September 1996. p. 56. ^ Grossman, Lev (November 15, 2012). "All-TIME 100 Video Games". Time. Time Inc. Archived from the original on November 18, 2012. Retrieved September 28, 2016. ^ Morales, Aaron (January 25, 2013). "The 10 best Atari games". Entertainment Weekly. Archived from the original on January 15, 2018. Retrieved April 17, 2016. ^ Stephanie Mlot (June 28, 2013). "MoMA Adds Seven Video Games to Art Collection". PC Magazine. Ziff Davis. Archived from the original on February 1, 2014. Retrieved January 17, 2014. ^ "Everybody Doesn't Like Something". Softline. March 1983. pp. 22–23. Archived from the original on July 29, 2014. Retrieved July 28, 2014. ^ a b Edwards, Richard A. (December 1981). "Capsule Reviews". The Space Gamer. Steve Jackson Games (46): 36. ^ Kohler, Chris (2005). "Chapter 3, Playing Arcade Games on Your Computer". Retro Gaming Hacks (1st ed.). O'Reilly Media. ISBN 0-596-00917-8. ^ Robert A. Jung (July 6, 1999). "Super Asteroids & Missile Command". IGN. Ziff Davis. Archived from the original on February 23, 2014. Retrieved January 8, 2014. ^ Chris Nashawaty (November 11, 1994). "PC Game Review: 'Microsoft Arcade'". Entertainment Weekly. Time Inc. (248). Retrieved January 8, 2014. ^ Doug Perry (November 13, 1998). "Asteroids". IGN. Ziff Davis. Archived from the original on February 22, 2014. Retrieved December 27, 2013. ^ Lance Ulanoff (November 16, 2005). "Atari Flashback 2". PC Magazine. Ziff Davis. Archived from the original on January 3, 2014. Retrieved January 3, 2014. ^ Dave Tach (November 12, 2012). "Atari Flashback 4 channels 2600 nostalgia with a 75 game bundle". Polygon. Vox Media. Archived from the original on December 27, 2013. Retrieved December 27, 2013. ^ Matt Casamassina (December 18, 1998). "Asteroids Hyper 64". IGN. Ziff Davis. Archived from the original on February 22, 2014. Retrieved December 26, 2013. ^ Jeff Gerstman (July 11, 2001). "Asteroids Anniversary Edition". GameSpot. CBS Interactive. Archived from the original on March 23, 2014. Retrieved January 4, 2014. ^ Kristan Reed (January 26, 2005). "Atari Anthology Review". Eurogamer. Gamer Network. Archived from the original on January 8, 2014. Retrieved January 8, 2014. ^ Tom Eberspecher (November 26, 2007). "Asteroids and Asteroids Deluxe on Xbox LIVE Arcade". Gamerscore Blog. Microsoft Games Global Marketing team. Archived from the original on June 2, 2009. Retrieved June 7, 2009. ^ "Classic Arcade Games Make a Comeback on Xbox". Microsoft. January 8, 2010. Retrieved January 8, 2014. ^ Amy-Mae Elliott (September 4, 2007). "Asteroids". Pocket-lint. Pocket-lint Ltd. Archived from the original on January 3, 2014. Retrieved January 3, 2014. ^ Craig Harris (November 8, 2010). "Atari Greatest Hits Volume 1 Review - IGN". IGN. Ziff Davis. Archived from the original on February 23, 2014. Retrieved January 7, 2014. ^ Williams, Gregg (December 1981). "Battle of the Asteroids". BYTE. pp. 163–165. Archived from the original on May 17, 2016. Retrieved August 12, 2015. ^ "Most Popular Software of 1978-80". Softalk. 1980. Archived from the original on December 10, 2008. Retrieved November 5, 2008. ^ Ahl, David; Staples, Betsy (1982). "Games for Clods". Creative Computing Software Buyers Guide 1982: 80. ^ Weiss, Brett (2007). Classic Home Video Games, 1972-1984: A Complete Reference Guide (1st ed.). McFarland. ^ "Mattel Intellivision - 1980-1984". ClassicGaming. IGN. Archived from the original on June 23, 2008. Retrieved May 16, 2008. ^ Chris Kohler (November 13, 2008). "Nov. 13, 1982: Teen Sets Asteroids Record in 3-Day Marathon". Wired. Conde Nast Publications. Archived from the original on July 12, 2009. Retrieved June 7, 2009. ^ Chris Gray (April 28, 2002). "After 20 years, master gamester finally honored". The Philadelphia Inquirer. Archived from the original on March 4, 2016. Retrieved January 8, 2014. ^ Chris Kohler (April 5, 2010). "Asteroids Player Smashes 27-Year-Old High Score". Wired. Condé Nast Publications. Archived from the original on April 7, 2010. Retrieved April 6, 2010. George, Gregory D. (September 7, 2001). "All About Asteroids". Atari Times. Archived from the original on September 27, 2007. "Asteroids - Rockin' the Arcade". Arcade. The Dot Eaters. Archived from the original on October 23, 2013.